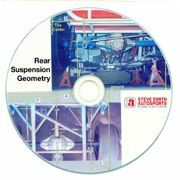 Analyzes rear axle bump steer and roll steer of 3-link and 4-link (aftermarket type) rear suspensions. Numerical data and graphs show you the amount of rear axle lateral movement, pinion angle change, axle steer and rear tire fore/aft movement. A very important program for monitoring rear axle movement and roll oversteer/understeer.